You love your church people, but then something goes wrong: an angry word, a misunderstanding, and things go sour. Or perhaps conflict in your church has escalated to the point where people are leaving or are intent on your leaving. What do you do? Where do you start? How can you move on? This book is designed to help pastors and other church leaders ask key questions about the nature and scope of conflict, and based on the answers, move beyond conflict and find resolution to such disputes. - Publisher You love your work. You love the people--most of the time. They respect you, most of the time. You work together with colleagues, staff, and laity, with energy and enthusiasm, most of the time. But then something goes wrong: a word spoken in anger, a misunderstanding, and things turn sour. What do you do? How do you deal with conflict, whether it be long or short-term, low or high intensity? Conflict is a part of the human predicament, yet it need not define or control your ministry. This book is designed to help the reader ask certain key questions about the nature and scope of the conflict they are experiencing and, based on the answers to those questions, move beyond conflict. The author lays out the variety of responses to conflict, running the gamut from avoidance to accommodation to compromise to collaboration. Written with the real needs of congregations in mind, this book will serve as a reliable guide to all who wish to move through conflict into a more effective and authentic fulfillment of their calling. You love your work. You love the people--most of the time. They respect you, most of the time. You work together with colleagues, staff, and laity, with energy and enthusiasm, most of the time. But then something goes wrong: a word spoken in anger, a misunderstanding, and things turn sour. What do you do? How do you deal with conflict, whether it be long or short-term, low or high intensity? Conflict is a part of the human predicament, yet it need not define or control your ministry. This book is designed to help the reader ask certain key questions about the nature and scope of the conflict they are experiencing and, based on the answers to those questions, move beyond conflict. 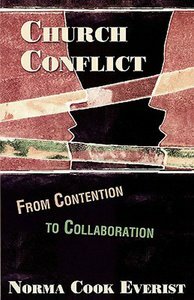 The author lays out the variety of responses to conflict, running the gamut from avoidance to accommodation to compromise to collaboration. Written with the real needs of congregations in mind, this book will serve as a reliable guide to all who wish to move through conflict into a more effective and authentic fulfillment of their calling. About "Church Conflict: From Conflict to Collaboration"
You love your work. You love the people--most of the time. They respect you, most of the time. You work together with colleagues, staff, and laity, with energy and enthusiasm, most of the time. But then something goes wrong: a word spoken in anger, a misunderstanding, and things turn sour. What do you do? How do you deal with conflict, whether it be long or short-term, low or high intensity? Conflict is a part of the human predicament, yet it need not define or control your ministry. This book is designed to help the reader ask certain key questions about the nature and scope of the conflict they are experiencing and, based on the answers to those questions, move beyond conflict. The author lays out the variety of responses to conflict, running the gamut from avoidance to accommodation to compromise to collaboration. Written with the real needs of congregations in mind, this book will serve as a reliable guide to all who wish to move through conflict into a more effective and authentic fulfillment of their calling.